Slow Travel is our favoured form of travel. It allows you to immerse yourself in the local community, get to know the locals. Slow travel doesn't mean skipping tourist or popular destinations either. Not at all. It’s all about how you decide to enjoy them and every other activity you decide to do. You can take the time to embrace everything around you, enjoy even the simplest things that aren’t necessarily the most popular or the most famous. Sitting at a cafe with coffee, beer or gelato, doing a spot of people watching is often a day well spent. Slow travel isn't a race and you can take your time and see things at your own pace with as many breaks as you need in between. We stay in places for a one month or more, using Air BnB accommodation. Staying for one month or more gives you a big discount on the price, up to 70% in some areas. Once we arrive, we don’t have to live out of a suitcase, we can unpack, get comfy, and see the area at our own pace, taking days off as we need or want. Rainy days don’t worry us, there’s always tomorrow. A kitchen means we can cook foods we love at our leisure, store our own snacks, and do our own laundry. We travel with minimal belongings, although it's still lovely to be able to unpack everything – simple things like putting our spice collection in the kitchen, finding space to put away our clothes and not living out of our bags. It makes it feel more homely and relaxed. We use train to travel, as we have Chelsea with us. She loves getting on a train, and settles down beautifully once she's greeted her fellow passengers (she believes they’re there just for her, and eventually they all agree). In August 2018 we got on the train at London Liverpool Street Station to begin our adventures in mainland Europe. We got the overnight ferry from Harwich to Rotterdam, managed to negotiate two bus journeys from the port to Rotterdam Centraal Station, caught the train to Munich, where we stayed for two nights, then boarded our train to Ljubljana, Slovenia for the first month. Sitting on a train, watching the scenery go by, having a drink, reading, having a snooze, working…it's great! Even if you don't have a dog, train travel can be very relaxing and help towards reducing your carbon footprint. And it’s so civilized! No big security checks, no having to be there hours before; just get on, find your seat and relax in style. The dining and drinks carriage is there when you need it. We never feel the need to use a travel guide. There are popular places for tourists (and there’s nothing wrong with that), but we never feel we have to see something just because a book said we should. Sometimes we see them, but we won’t feel bad for skipping them either. Go off the beaten path and enjoy getting lost for a change. You never know what unexpected fantastic places you might discover. We find Atlas Obscura to be a reliable source for spots that might not be found in a guide book, but the locals “in the know” can get you to. A walk at sunset is a way to avoid the crowds and a good photo opportunity. We walk whenever we can (although we understand that this isn't for everyone). If you can, then this is one of the best ways to explore a new place and hopefully help you to accidentally stumble on unknown interesting sights. It might be a slow way to move around but we prefer it. We use public transport only when we have to cover long distances, or if we are feeling tired; otherwise we usually use our legs as transportation, which also makes Chelsea happy. Choosing a good a pair of hiking shoes or sandals really can make all the difference for walking, whether in the City or muddy paths! If walking isn’t for you, try cycling instead. Many cities have schemes to hire bikes for free. We were extremely impressed with the cycle friendly cities of Ljubljana, Vienna, and (name any place) Holland that have miles of lanes dedicated to cyclists. We dine out selectively and strategically, generally favouring home cooking. 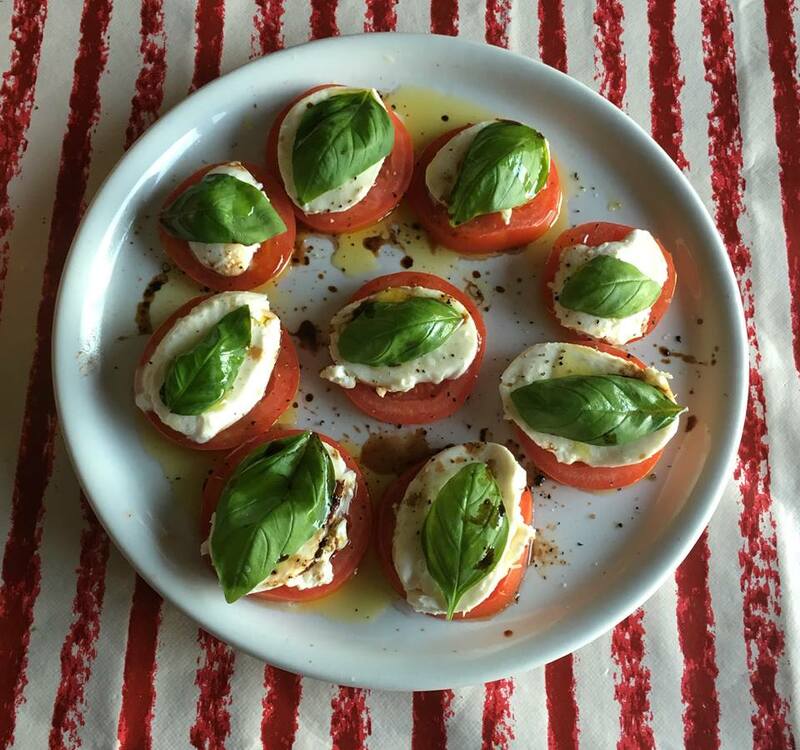 We had a month in Verona and the tomatoes from the local discount supermarket were the best we'd ever had. Why not find out if you can find cooking courses local to the area you are and discover another cuisine to add to your cooking skills? Homemade Caprese salad, ala Lisa T. The ingredients were all purchased from the Lidl across the street. One of our best purchases has been our Roku. It plugs into any TV and gives you access to Netflix, Amazon Prime, your favourite television stations and programmes, all available in one small, portable stick that fits in your pocket. You can relax in the evenings with a drink and watch a film or whatever you like without feeling you have to go out and spend a lot of cash, especially on rainy evenings or nights when you just need a break. Since we started travelling, we have made some very good friendships, with Scarlett and Marcus, fellow travellers ; plus all our wonderful Air BnB hosts. Chelsea has made friends with Stevie the staffy, Juno, Kaia, Max and many more furry friends. Slow travel affords you the time to get to know people better and form friendships. We understand that everyone is different and like to do things differently – but for those willing to make their own way of travel, and set their own pace; slow travel can be an eye opening way of doing it. We can’t imagine ever spending one week or 10 days somewhere ever again!